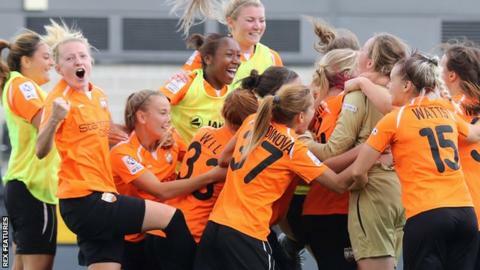 Chelsea Ladies suffered a shock Women's Continental Cup first-round exit as they lost 4-2 on penalties to second-tier London Bees after a 3-3 draw. Holders Arsenal safely navigated a tricky away tie at top-flight Reading, winning 3-1, while Women's Super League One leaders Manchester City won 8-0 at WSL 2 side Aston Villa. Liverpool Ladies won the Merseyside derby at WSL 2 side Everton 1-0. Sheffield FC Ladies beat Bristol City Women 2-0 in the only all-WSL 2 clash. Chelsea, winners of the Women's FA Cup and the league title in 2015, fielded four senior England internationals in their starting XI, but were trailing 2-1 when their defender Niamh Fahey was dismissed late on. Down to 10 players, Chelsea sent the game to extra-time with Millie Bright's stoppage-time goal before Beth England put them 3-2 up, but Deanna Cooper's leveller brought about a penalty shootout. England winger Karen Carney and South Korea forward Ji So-Yun both missed penalties for Chelsea before Merrick Will struck the part-time side's final kick. On Sunday, the remaining first-round ties see Doncaster Rovers Belles host Sunderland, Oxford United host Birmingham City and WSL 2 leaders Yeovil Town host Notts County Ladies. Chelsea Ladies manager Emma Hayes: "The Bees put everything on the line for their team. It was a fantastic effort against a group of professional players and they deserve what they got from the game. "It wasn't about who has the best individuals because that's clear. Ultimately the best team won because they took all elements of the game seriously and they respected the opponent." London Bees substitute Merrick Will: "It was brilliant. It's great to beat Chelsea, a quality side like that, and go through to the next round. "We came into it with not much pressure and I knew we could do it. We definitely went in there underestimated and I think that showed in our performance."